TubeNet • View topic - FS: Miraphone 481 Elektra, 5+1GB SOLD!! FS: Miraphone 481 Elektra, 5+1GB SOLD!! Yet again, I find myself with more than one F tuba in the house. Can’t keep both, unfortunately. The instrument has been used in a few orchestras (Fantastique, Mendelssohn “Reformation”), big bands, and quintets. It’s a Firebird with better intonation and steering, in my opinion. The instrument works GREAT and is a low register monster with the TU-28 mouthpiece that comes with the tuba. I’m a PT-64 guy, and while it worked fine on that mouthpiece, the low end can get a little bright with the 64. Included with the tuba is a blue Miraphone 481 gig bag. The bag has probably left the house less than 40 times and never sat in a mud puddle. Basically, it looks like new. Also included is all of the stuff you get if you bought it New: polishing cloth, screwdriver, TU-28 mouthpiece, utility bag, brochure. Price is $8400. I will consider offers, but submitting an offer is no guarantee that the offer will be accepted. Any sale will be considered closed only when both the buyer and seller agree upon a price. Acceptable forms of payment are: cashier’s check, personal check (will have to clear before the horn leaves the house), or PayPal. If paying via PayPal, please add 3% to the agreed upon price. Tuba is located 15 miles east of downtown STL. Feel free to come by if you’re interested in trying the tuba. I do have a shipping box, so I can ship the tuba, but will ONLY do so via Old Dominion freight lines. Shipping will be at the buyer’s expense, and will likely be @$350 with insurance included. Thanks for reading, pics to follow. Last edited by ckalaher1 on Sat Feb 16, 2019 6:16 pm, edited 5 times in total. This tuba is ON HOLD for trial currently. I’ll change the title heading back to FOR SALE if the situation presents itself. The HOLD on this tuba has been removed. A prospective buyer was set to fly in to try the tuba on the 21st, but logistics got in the way. I’ll send a PM to those who inquired about the tuba before the HOLD was in place. As always, PM with questions. Plenty of online tire kickers, but no one has stopped by to test it out yet. I’ll keep it for a few more weeks, then off to consignment. Bump for a great horn and seller. I’ve had the opportunity to play this horn several times and it is as advertised. 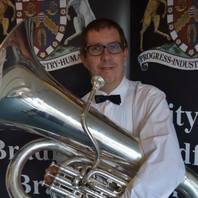 The high range is effortless and the low register is very open with no wonky notes like some other F tubas are known for. The low C is definitely usable. Tuning isn’t just ‘good for an F tuba,’ it is just good and minimal slide pulling is needed. Whoever buys this horn will not regret it. The horn has a great sound for solos, quintets, and orchestras. I’d also consider this if I were in a one tuba for everything situation. I’ve known the seller for a long and can guarantee whoever buys this horn will have a very easy and hassle free experience. Tuba is on hold pending funds. Pete, you beat me to the punch! Horn is sold and shipped out to the UK yesterday. Thanks to all those who inquired.